Christopher Nolan's Batman trilogy has been one of the most successful film series of all time, so it comes as no surprise that everyone wants their own real-life versions of the Dark Knight's gadgets and vehicles. 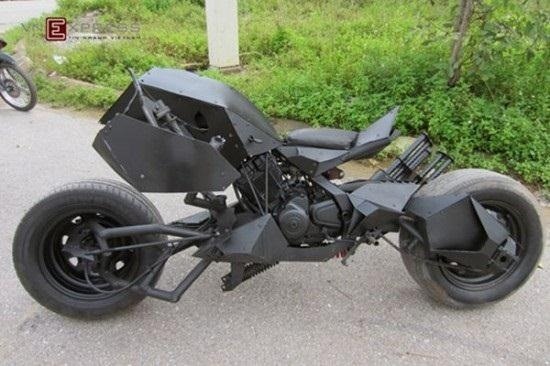 Arguably one of the coolest vehicles ever invented (whether it's real or not), the Batpod is no exception. 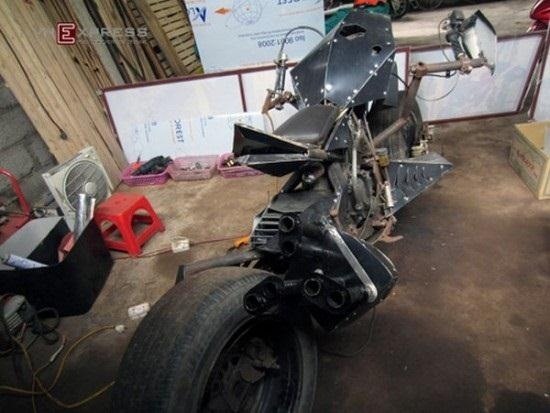 Other replicas of Batman's awesome cycle have been made, but the real thing would cost a boatload to build, so a Vietnamese mechanic named Tùng Lâm decided to make his own poor-man's version by modding a bike he already had. Starting with a Suzuki FX 125 and a couple of used car tires, Lâm built his Batpod using cheap scrap parts he had in his garage. He's using the final product as an advertisement for his car shop in Lang Son to bring in curious customers. It may not look exactly like the real thing, but it's pretty impressive for a young mechanic who had very limited materials. He hopes to build a better version in the future, and would also like to eventually tackle Batman's Tumbler as well. You can see his Batpod in action below and read more about his project here. Check out a higher-tech Batpod replica by SDParker, plus a bunch of other DIY Batman gadgets here, and learn whether they would actually work in real life. If you had to choose (just one! ), which one of Batman's gadgets or vehicles would you like to see come to life? News: Born and Bread Prankster!